Wait a second, this isn't Japanese? Hell, it isn't even an OEL manga! What are you trying to pull here, man? 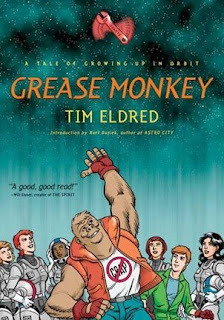 Released by Tor Books, Grease Monkey is the true debut of comicbook artist Tim Eldred. But don't be fooled; Tim is much more than an ordinary American comicbook artist. He also happens to be a longtime anime "superfan," the author of the official Star Blazers webcomic, webmaster of the Star Blazers website, producer of the same show's DVDs, and the ultimate expert on Star Blazers in the country. Needless to say, this book has got a couple anime influences here and there. Grease Monkey is the story of two mechanics on the military space station "Fist of Earth." Robin Plutnik is a rookie who's not sure what to make of his partner, the head mechanic for their squadron, McGimben "Mac" Gimbensky. The catch? Well, there's two. The Earth was nearly wiped out by an alien army years ago, so to make up for the loss of a human population, gorillas were given human-like intelligence. You guessed it -- Mac is an 800 lb. gorilla with an attitude. Not only that, but Robin and Mac's squadron is none other than Barbarian Squadron, the top-ranked one on the station, which also happens to be completely made up of beautiful women. Throughout the twenty-four chapters of this book, Mac and Robin go through tons of misadventures in almost sitcom fashion, learning about the ship, it's crew, and each other as they go along. When I say sitcom fashion, I mean sitcom fashion. The stories in this comic are self-contained snippets of life on the Fist of Earth. They are definitely fun, but this sometimes results in overly wholesome stories that need a little more bite to them. Regardless, there are underlying plot threads (especially in the later chapters) which belie not only Eldred's anime background, but also his subtlety of storytelling. Sometimes, though, Eldred's seemingly simple storytelling can truly amaze. Robin and Mac fight, make friends, fall in love, and make mistakes with startling honesty. When Eldred isn't busy developing his cast of primates, he is touching briefly on important issues like racism, politics, and even tragedies like September 11th and the Hiroshima bomb. Once the story hits chapter seven, however, the jump in art quality is immediately recognizable. Eldred drops the colored look (which hampers the first six chapters) for a much more sophisticated, high-contrast black-and-white style, cleans up his character designs, and adds a lot more emotion and energy to the scenes. EDIT: You can find the first six chapters in full color and the first half of Tim's upcoming Book 2 on the official Grease Monkey website. There are some moments here that simply breathe with life. Mac floating weightlessly into space, staring at the heavens -- Robin storming down the hallway, eyes ablaze, incensed at the world -- Mac and his sweetheart asleep on a park bench. For its twenty-buck price point, Grease Monkey packs a lot of reading material. In addition to the 24 chapters of story, there are three vignette stories (anywhere between two and eight pages), a heartfelt introduction by Kurt Busiek (author of Astro City) an extensive history of Grease Monkey written by Tim Eldred himself, and Tim's own liner notes for each and every chapter and vignette. Plus, the print size is considerably larger than a manga. All in all, it's a fantastic deal, even if I'm a bit disappointed about the lack of hardcover in this new edition. Sure, some people might find Grease Monkey too light a story for their tastes. Nevertheless, this is much more than the sum of its relatively tame parts, resulting in a fun, well-written comic for all kinds of readers. This is a fantastic deal that no comic fan (and most manga fans) will want to miss.